An artist's view shows NASA's New Horizons probe observing the Pluto-Charon system. President Obama congratulated NASA on a successful Pluto flyby Tuesday on Twitter. President Barack Obama fired off a congratulatory tweet Tuesday (July 14) celebrating the first-ever flyby of Pluto, which NASA's New Horizons spacecraft performed earlier that day. New Horizons zoomed within 7,800 miles (12,500 kilometers) of Pluto Tuesday morning, capturing history's first up-close looks at the far-off dwarf planet and its five known moons. Prominent scientists and supporters all over the world issued statements and speeches in celebration — including President Obama. "Pluto just had its first visitor! Thanks ‪@NASA — it's a great day for discovery and American leadership," the president said via his official Twitter account, @POTUS. Humanity has taken a number of big space-exploration steps since President Obama took office in January 2009 (though the missions were set in motion before his time). For example, Obama's presidency has seen NASA launch the planet-hunting Kepler mission, which has discovered more than half of the nearly 2,000 known alien planets to date. And the first man-made orbiters of Mercury, the giant asteroid Vesta and the dwarf planet Ceres reached their destinations in the past six years. NASA's Voyager 1 probe, which launched in 1977, became the first spacecraft to reach interstellar space in 2012. And last year, the Rosetta orbiter, built by the European Space Agency, landed a probe on the surface of a comet for the first time ever. 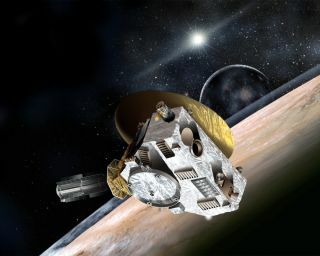 New Horizons' visit to Pluto marks another milestone, a visit to the last (and usually most distant) of the nine classical planets that remained unexplored — but it's also just one of many objects residing in the outer reaches of the solar system that may have stories to tell.